First Line: Waiting was the worst bit: hunkered back against the wall, eyes squinting in the setting sun, waiting for the nod. There's strange goings-on in Aberdeen in this fifth outing by Detective Sergeant Logan McRae. For one thing, it's summer, and the folks in Aberdeen, Scotland don't seem to be familiar with sunshine or warmth. For another thing, the Polish immigrant community is being targeted in a series of gruesome attacks, and McRae actually gets to leave the country to follow up on leads. Most people seem to think these attacks are hate crimes against the Polish, but when a local crime boss is targeted, McRae begins to wonder if something else might be going on. Other than that, the situation seems to be normal: The Detective Chief Inspector seems to have it in for our lad and Detective Inspector Steele continues to go out of her way to make his life miserable. Even though I'd love to slap her briskly about the head and shoulders most of the time, I do like the character of Steele: she serves to remind people that men don't have the politically incorrect slob market cornered. The story moves right along at a good pace, but I'm beginning to notice a change in McRae. Through four books the young man has been unerringly idealistic no matter what is done to him or how many idiotic superiors try to break him. There has been plenty of humor to break the gruesome case load into manageable portions. Not so much in this one. The humor is less, and all the characters seem grimmer. With the lack of humor, the violence of the villains isn't as well disguised and isn't as easy to stomach. How many more infinitely inferior superiors must McRae go through before he leaves the force? Give the poor man a promotion, an entire weekend off, and transfer D.I. Steele! I just love this series and took Blind Eye to read at my daughters when I had my accident but due to a load of other books I took I never got round to reading it - mental note, read this next. The Chief Inspector I love due to his constantly eating sweeties and the humour throughout the books. Steel is just so nasty to him but I think she also has a soft spot for McRae that she keeps to herself. Admittingly the series can be a bit graphicaly gruesome but it doesn't put me off lol. Cathy - Thanks for this review. I, too, like the Logan McRae series and part of the reason I like it is exactly what you mention: McRae's optimism, even idealism and the (admittedly dark) humour. 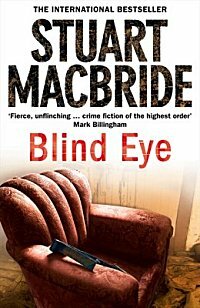 I admit I haven't read this one, but I hope that MacBride isn't going to turn the series too bleak. As you say, it can get gruesome and I think that could turn the series too gory for me. Oooh, another series to add to my endless list. I enjoyed his interview and have found that my library has the first book in the series. Yea! Barbra-- I think the humor has a lot to do with my tolerance of the violence. Margot-- I have the next book in the series sitting on my shelf, and I'm so tempted to read it and see where MacBride is going with one of my favorite characters!